This unique bit of fitness tech controlled by Google's wearable computer will be revealed at the Consumer Electronics Show next week. If you're going to CES with some extra Christmas weight, then you may want to check out this tech-driven treadmill. Technogym are giving CES attendees the opportunity to try out the treadmill that is fully controllable via Google Glass. Running the company's brand new UNITY technology, the android-based console display platform for cardio training equipment, the smart treadmill and other Technogym equipment can interact with apps and third-party devices – such as Google Glass. The treadmill boasts a fully-personalised experience with automated access to all of your individual settings with social media, website bookmarks and other multimedia features. 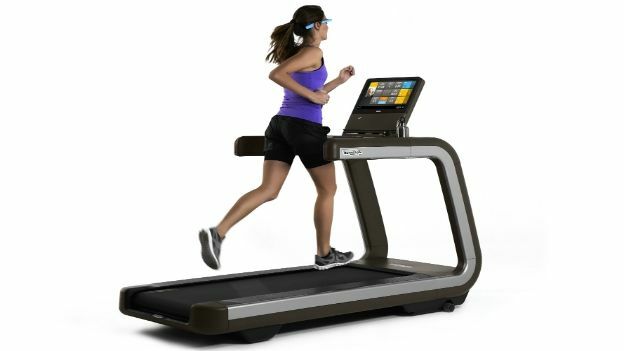 Its UNITY system is an Android 4.0 platform with available apps on the Technogym App Store. If you find yourself needing motivation then you can even communicate with your personal trainer or friends via webcam. Nerio Alessandri, President and Founder of Technogym said: “With the look and feel of a tablet, Technogym's UNITY console offers a revolutionary, interactive training experience. Technogym is a worldwide supplier of products and services in the fitness industry and was the official supplier for the last five editions of the Olympic Games.